I love pork crunch. Have done for years. It’s the perfect crunchy beer snack in a pub when I don’t fancy crisps and my tired old teeth don’t relish chopping through a bag of hard pork scratchings. 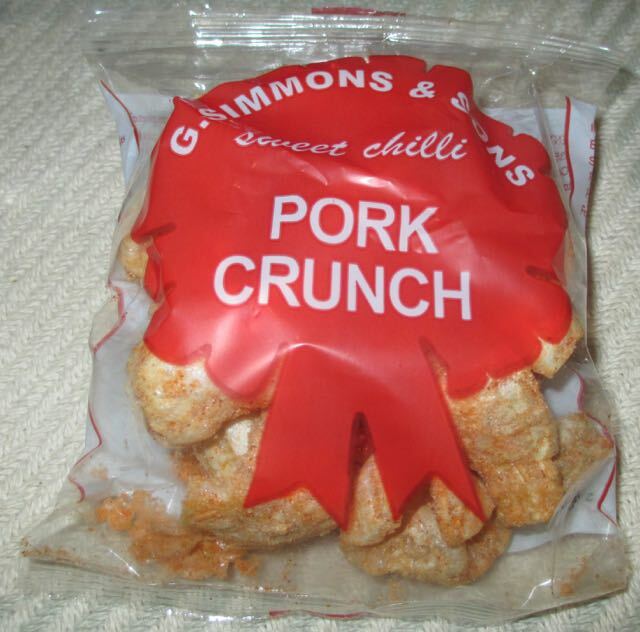 This Sweet Chilli Pork Crunch by G. Simmons & Sons in Walsall certainly didn’t have far to travel to my eager gob, as I live not a million miles away in Wolverhampton. I like spicy crisps and have had a few chilli pork crunch bags in my time, so this sounded ideal for an accompaniment to lunchtime sandwich. On opening the bag there was a powerful salty tomato and spicy smell to these reddish coloured pork crunch. The pork crunch had a soft crunchiness with a very flavoursome salty tomato flavour with the chilli and ginger spices hitting my tastebuds and light hints of onion and garlic as they washed around my mouth towards the end of each mouthful. Moreish and with a medium chilli heat, they left a tingly burn in my mouth at the end of each pork crunch. Mmm… these were very good indeed. Now where’s my beer? The 30g bags ingredients included; pork rind, salt, flavour enhancer E621, E625, tomato powder, dextrose, cayenne, ginger, acidity regular E262, hydrolysed vegetable protein, garlic powder, onion powder, food colour E160, and spice extracts.